The All Black Cargo Car was found exclusively in the Brendam Fishing Dock destination with item number of LC99362. Cargo cars sold in other sets are not included in this recall. 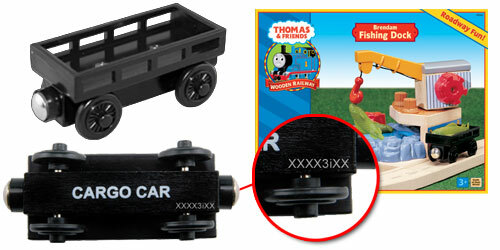 Only those All Black Cargo Cars with black sides and wheels as shown in the image at right are subject to this recall. Please check the tracking code on the bottom of the vehicle as shown in the circled image above. Only those vehicles that have either no tracking code or the following tracking codes are subject to this recall. If you determine that you have one or more of the affected All Black Cargo Cars, please follow the return instructions. Only the models with a brake lever as shown in the image at right are subject to the recall. Please check the tracking code on the bottom of the vehicle as shown in the image at right. Only those vehicles that have a tracking code 1656OW00 are subject to this recall. If you determine that you have one or more of the affected "Toad" vehicles with brake lever, please follow the return instructions. 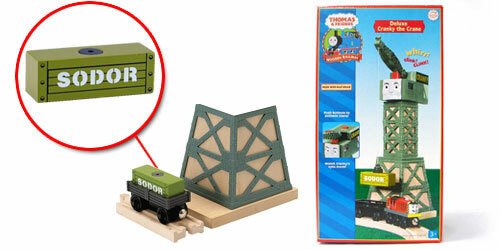 The Olive Green Sodor Cargo Box as circled in the image at right. The affected Olive Green Sodor Cargo Box was found exclusively in the Deluxe Cranky the Crane with item number LC99371. Because the Olive Green Sodor Cargo Boxes do not have a tracking code, please return any Olive Green Sodor Cargo Boxes from the Deluxe Cranky the Crane. Current production of the Olive Green Cargo Box has a tracking code on the underside and is not included in the recall. 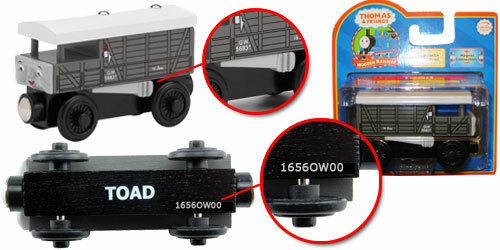 No other Sodor cargo boxes are included in the recall, including those sold in sets other than the Deluxe Cranky the Crane. If you determine that you have one or more of the affected Olive Green Sodor Cargo Boxes, please follow the return instructions. The All Green Maple Tree Top circled in the image at right. The affected All Green Maple Tree Top was found exclusively in the Conductor's Figure 8 Set with item number LC99535 or LC99535T. Because the All Green Maple Tree Top does not have a tracking code, please return any Green Maple Tree Tops from the Conductor's Figure 8 sets. Current production of the All Green Maple Tree Tops has a tracking code on the underside and is not included in the recall. No other Maple Tree Tops are included in the recall, including those sold in sets other than the Conductor's Figure 8 sets. If you determine that you have one or more of the affected All Green Maple Tree Tops, please follow the return instructions. The Green Signal Base as circled in the image at right. Because the Green Signal Base does not have a tracking code, please return any Green Signal Bases from the Conductor's Figure 8 sets. 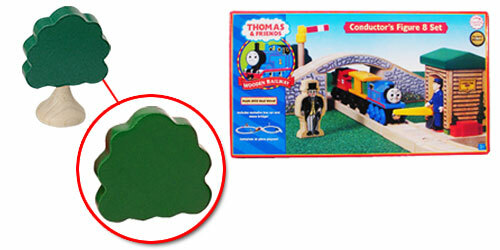 Current production of the Green Signal Base has a tracking code on the underside and is not included in the recall. No other signals bases are included in the recall, including those sold in sets other than the Conductor's Figure 8 sets. If you determine that you have one or more of the affected Green Signal Bases, please follow the return instructions.